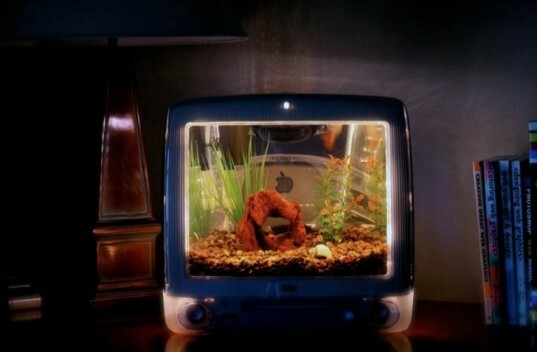 Macquariums: Candy-Colored Apple G3s Recycled into Aquariums! Macquariums: Iconic Candy-Colored Apple iMacs Recycled into Aquariums! In a matter of a few short years, Mac computers have morphed from candy colored bubble into slim, elegant, and noticeably less colorful designs. 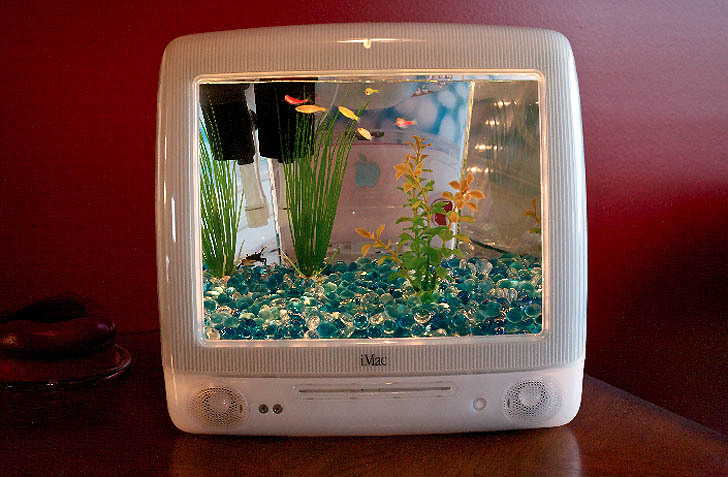 But the iMacs of yore still have a wonderful charm about them, which is why Jake Harms recycles them into a home furnishing with a cool new use - a home for your fish! Called Macquariums, these translucent Mac shells now host underwater paradises for our scaled Apple enthusiasts. Harms sources the iMac shells from recyclers for his aquariums, giving new life to the previously obsolete comps. To make them look shiny and new, he then polishes each with a high speed buffer, restoring the bright hues to their original glossy glory. The inner tank follows all of the curvaceous lines of the original iMac, including a curving bubble front that lines up flush with the iMac’s screen, creating a perfect view from the outside. The tanks come in the same vibrant colors as their iMac predecessors- blue, aqua, white, smoke, red, flower power and blue dalmation. Each Macquarium holds a three gallon tank, which is plenty of room for 1 to 3 dwarf frogs, red claw crabs, fancy guppies or betta fish to swim happily. The fish tank comes with a built in filter and miniature lights that line the “screens,” which creates a dazzling effect at night time. The décor of the interior of the tank is up to you, so feel free to create a colorful scene with brightly colored gravel or plastic plants. Giving new life to the now obsolete Apple G3 iMac, Harms sources the iMac shells from recyclers. To make them look glossy and new, he then polishes each with a high speed buffer, restoring the bright hues to their original glossy glory. The inner tank follows all of the curvaceous lines of the original iMac, including a curving bubble front that lines up flush with the iMac’s screen, creating a perfect view from the outside. The tanks come in the same vibrant colors as their iMac predecessors- blue, aqua, white, smoke, red, flower power and blue dalmation. Each Macquarium holds a three gallon tank, which is plenty of room for 1 to 3 dwarf frogs, red claw crabs, fancy guppies or betta fish to swim happily. The fish tank comes with a built in filter and miniature lights that line the “screen,” which creates a dazzling effect at night time. The décor of the interior of the tank is up to you, so can create a colorful scene with brightly colored gravel or plastic plants, casting a colorful glow to the room. Macquariums upcycle a fantastically designed modern relic- while also turning an old iMac into a home to foster life. Harms even offers Macquarium Kits, should you have an old iMac yourself that you just haven’t been able to let go.